A denture is a custom-made removable appliance which is worn to replace lost or missing teeth, to enable you to enjoy a healthy diet and smile with confidence. A denture replaces your natural teeth and provides support for cheeks and lips. Without this support, sagging facial muscles can make a person appear older and reduce their ability to eat and speak. A good denture can improve chewing and eating activities, aid speech, enhance facial expression and raise confidence. 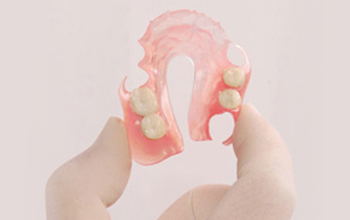 A complete denture is one that replaces all of the natural teeth. A partial denture fills in the spaces created by lost or missing teeth and is sometimes attached to your natural teeth with clasps. 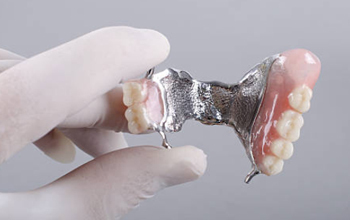 Metal alloy dentures are usually preferred to plastic dentures because they are stronger and more comfortable; they are also better for general oral health than plastic dentures. The metal part of the denture is covered with flesh coloured plastic to disguise it and enable it to blend in and create a natural looking aesthetic. They are partial dentures which adapts to the constant movement and flexibility in your mouth, without visible metal clasps. Patients find that flexible partial dentures feel more natural and comfortable in the mouth, due to its thinness and lightweight, plus gives them more confidence when eating and smiling because of the excellent retention and aesthetics. A patient with dentures must see their dentist frequently in order to make sure the dental appliance maintains its effectiveness and function over time. Your jawbones and gums naturally shrink over time and this can cause the dentures to fit less securely. Ill-fitting dentures can give rise to chewing difficulties, soreness, infections and changes in facial support. Your dentures may need to be adjusted, relieved or even relined from time to time to ensure an optimal fit.